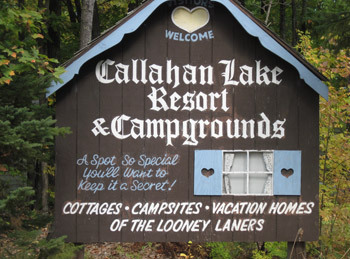 Callahan Lake Resort & Campground is unique offering the ultimate in natural wilderness beauty and full spectrum of family pleasure. Although only 13 miles from Hayward, it is discreetly “hidden” in the vast solitude of the Northwoods. The resort and campground are located on the shoreline of Callahan Lake, a lake long known to be one of the most active musky and largemouth bass fishing lakes in Wisconsin. Appealing to all ages, the resort is complete with cottages, campground, a lodge with large recreation room, full liquor bar,,lunches, candy corner, beach,playground, boats,canoes, pontoons, paddle boats, old fishing lure collection, craft shop, a safe roped in swimming area for the toddlers and a favorite swimming raft called “the Loose Caboose”. The shoreline has many docks to fish from. You’ll love the cottages with their Scandinavian chalet design in a wooded hillside setting. Besides being modern, full housekeeping and clean, they’ve been decorated with that “personal touch”. Campers will enjoy the un-crowded, wooded campsites with electricity, picnic tables, showerhouse with flush toilets, playground, and a water-fill and sanitary station. The lake can be viewed from all the drive-in sites. There are also permanent year around camper sites.